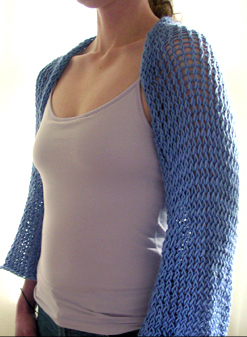 One of my first designs, this super easy Lacey Shrug is made with worsted weight yarn to make it light as air and loosely flowing. The sample is made with Microspun from Lion Brand. If you are beginner and want to make something different, give this design a try! Stitch Techniques: E-wrap, knitting as a flat panel, knitting in the round and flat panel bind off.